« You keep using that report… I do not think it means what you think it means. Some are born geeks, some achieve geekiness, and some have geekiness thrust upon them…. I like to think of myself as an alpha geek. Geekiness is something to be respected, enjoyed, and promoted. Let me share some of my “geek cred” with you. Learned BASIC on a Radio Shack TRS80 Model 3 and I still have 5.25″ floppies which contain my early programming efforts. Own a complete in box 1972 Odyssey, the first home video game system. Before I left Michigan, I owned nearly every video game console sold in the US. Have more than 600 Nintendo NES games all complete in box. Have an original Super Mario statue that is nearly 4 foot high. He used to be part of a Nintendo store display from the 80’s. With such impressive geek fu, it’s not often that another geek humbles me. Well, several months ago while working through some SQL Server performance issues, I came across the blog of Brent Ozar. I read an excellent article he authored with instructions for using Perfmon, and he’s been a great source of information and direction for me since. 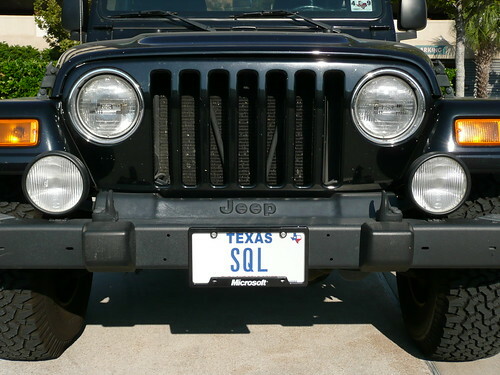 He’s a SQL Server geek of the highest order. Anyway, he posted a picture of his Jeep to his blog some time ago, and I was immediately humbled in the presence of a supreme geek. Yes, that is his real license plate. So, if you are as interested in SQL Server as I am, and believe me everyone using the SQL versions of Made2Manage should be, give his blog a read at www.brentozar.com. 3 comments to Some are born geeks, some achieve geekiness, and some have geekiness thrust upon them…. Ooooo, I like the Super Mario statue. I think that trumps my license plate! Well, you definitely outdo me on the geekiness. I can’t match the 600 NES games still in their boxes, and I can’t claim the Mario statue. And yeah, I think Mario trumps the license plate too. That’s pretty big. Dragonlance alone doesn’t do much for you though. If you don’t have Forgotten Realms, Ravenloft, Darksun, and Eberron thrown in there too then you’ve still got room for improvement there. Having several of the Choose Your Own Adventure versions helps too. If you have all of the core rule books for the game for all versions, then we can talk. If you also have every supplemental book for all of the versions then…well, that’s too much even for me so I’ll just let you take that one.